Prolific even by eighteenth-century standards, Eliza Haywood was the author of more than eighty titles, including short fiction, novels, periodicals, plays, poetry, and a political pamphlet for which she was briefly jailed. From her early successes (most notably Love in Excess) to later novels such as Betsy Thoughtless (her best known work) she remained widely read, yet sneered at as a 'stupid, infamous, scribbling woman' by the likes of Swift and Pope. Betsy Thoughtless is the story of the slow metamorphosis of the heroine from thoughtless coquette to thoughtful wife. Ironically, the most decisive moment in this development may be when Betsy decides to leave her emotionally abusive and financially punishing husband; it is only after experiencing independence that she returns to her marriage and to what becomes her husbands deathbed. 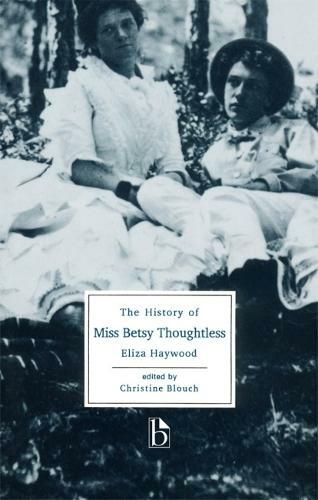 Betsy Thoughtless may be the first real novel of female development in English. In this edition the text is accompanied by appendices, including writings from the period that shed light on Haywood's life and work, and on her relationship with contemporaries such as Henry Fielding.